Still alive and well in the USA. Made in September 2015, Foshan, China. 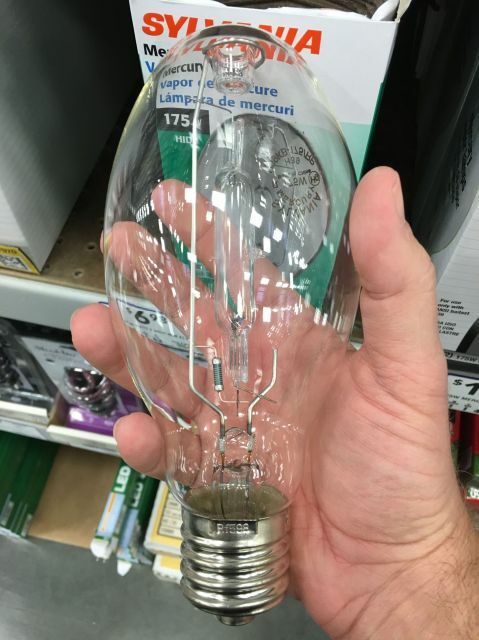 I thought mercury vapor lamps can still be made. I see that sylvania has the rounded outer envelope lately like ge and philips. I like the classic slyvania shape better though. Just like the westinghouse Mercury's. "we shall outshine the LEDS"
I see neewr sylvania MH bulbs in BT bulbs. I wish they'd do so with mercs also. What would be cool is a BT-whatever for 50 or 75w mercs. Too bad it wasn't made in Manchester, NH. Chinese Sylvania mercury bulbs are pretty well made. I agree. I had a Sylvania bulb of 175w merc but it has a weak weld. Agreed. They last for years. Silverliner in his title, refered to the EU mercury ban, which shouldn't affect the US. The Sylvania ED lamps are made in Mexico. Osram Sylvania closed its Manchester, NH plant in September 2014. Nope. EYE makes their own HID lamps in Mentor, Ohio. Then did Sylvania at one time source lamps from EYE? EYE's standard MultiMetal lamps are identical to USA made Sylvania MetalArcs, in fact without the etch you couldn't tell em apart. Unless both plants used the exact same lamp manufacturing machines. Oh, EYE sources in the basic HPS and MH lamps from Sylvania, EYE makes the more premium lines. Some are made in Japan. From personal experience, I've seen Philips 175/250w MV made in China lamps to actually being an improvement over their last USA made lamps. Kinda sad how they were treating that. Yes, I agree, Philips current Chinese 250w MV lamps are superior to the older US made lamps, phosphor color is much better (warmer), and the lamp construction appears better too. I checked my 2003 us lamp and 2011 chinese one and the 2011 one had bigger electrodes. I have a few brand new Philips H37KB-250 clear lamps, bought at a restore for next to nothing. Made in 2014. Do the Chinese made /DX lamps have good color stability over the long term? That's a good question. I wanted to get one of the 100w ed17 Sylvania cram lamps at blowes but I didn't see any tonite. Maybe I'll look at menerds. I'll check some at a strip mall near home. 6-7 years of use. Great MV lamps are still being made! When I moved from Europe to Canada about 10 years ago, I saw modern clear MV lamps for the first time (in Europe I only saw coated MVs). Since then I saw a lot of new clear MVs here: new dusk to dawn fixtures use a clear MV; the Montreal Métro transit still replace some old coated MV bulbs by clear ones; some parks use them; etc. So I really wonder why clear MVs are still made, at the same time as the "DX" version: they aren't brighter than the coated version and their colour rendering is awful* making skin greenish; I'm not sure the lack of coating makes a great difference of manufacturing coasts. I could imagine they were intended to parks (because of vegetation) if there weren't sold with dusk to dawn fixtures. Do manufacturer want customers to find MV lighting so ugly that they upgrade to metal halides or led? Here in Tasmania mercury lamps are almost extinct. Clear lamps in ED bulbs are non-existant, (like in Europe) but there are still a few EYE/Iwasaki HT-400's and HT-250's (Clear T-48 Bulbs) about in some streetlights. Almost all our meager supplies of Mercury Lamps are either Foshan, (Branded Osram), or Ya-Ming, branded Philips or really dodgey cheap Chinese stuff branded Nelson...and that's it for this geographical location! Foshan have actually made mercury lamps for decades, long before their association with Osram and it North American arm, Osram-Sylvania. Somewhere in the collection I have some genuine Foshan branded mercury lamps I picked up in Viet Nam fifteen years ago. I don't know about the manufacturers, but as an enthusiast, I *love* clear MV lamps, I find them wonderful, the colour rendering isn't important, personally I love clear lamps of any type, as I can see the internal construction, it interests me how they are made.